The new Sphinx International Airport (SPX) in western Cairo saw its first regular domestic flight as part of a trial operation of the airport, which is the part of the government's plan to stimulate tourism to the country. The Minister of Civil Aviation Younes El-Masry and thr Minister of Tourism Rania Al-Mashat attended the ceremony to launch the flight from Sphinx to the popular South Sinai resort of Sharm El-Sheikh. The airport aims to alleviate pressure on Cairo International Airport, which is located in eastern Cairo, and serve the Greater Cairo districts of 6 October and Sheikh Zayed, as well as the governorates of Fayoum and Beni Suef. It also aims to serve tourists coming to visit the pyramids and the new Grand Egyptian Museum (GEM), which is set to open in 2020, according to a statement issued by the ministry. Construction work on the new airport started in 2017 by the Egyptian Consultancy Company with a budget of EGP 300 million. 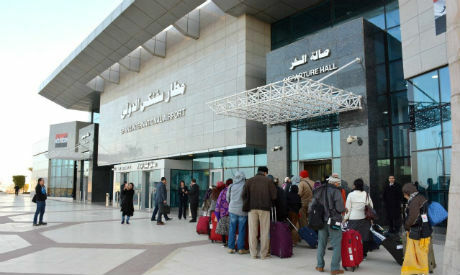 During his tour of the new airport, El-Masry said that 2019 will witness a breakthrough in the civil aviation industry through the construction of new airports in the New Administrative Capital, which is located 45 kilometres east of Cairo, and the resort town of Berenice in Marsa Allam’s on the Red Sea in South in south Egypt. The SPX has been dubbed the “300 passenger airport” per its accommodation capacity per hour. The airport has a 975 square metre departure hall and a 1,100 square metre arrival hall. It also has a VIP hall. The new airport is equipped with state-of-the-art technology in air traffic control and automatic landing systems and security systems such as x-ray explosive detectors and high end CCTV and thermal surveillance cameras.